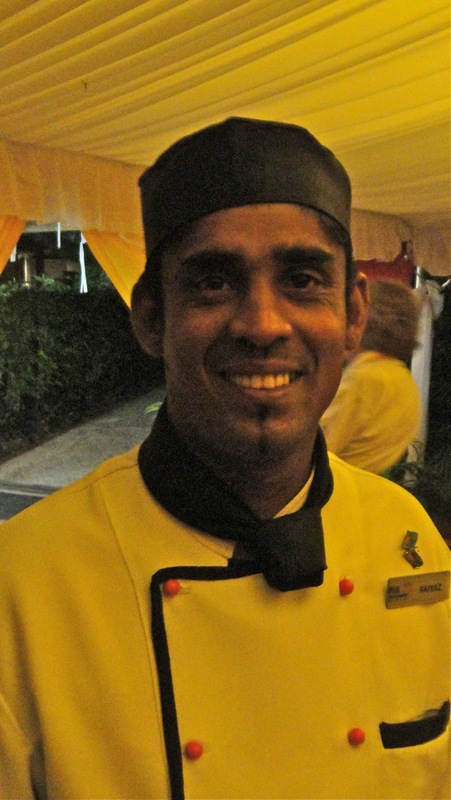 Chef Faiyaz at Fiji Hideaway Resort and Spa on Viti Levu's Coral Coast demonstrated the art of making curry to a group of travel writers and photographers from the Freelance Council of the Society of American Travel Writers. I missed the demonstration but not the curry which was wonderful. Too wonderful not to share the recipe, so Bula! Go out and try it. * Look for fresh curry leaves at an Indian market or on line. Do not substitute basil leaves; better to omit altogether. Heat oil in cooking pot, add onion, curry leaves, cumin seed, fenugreek, sauteing until lightly browned. Add garlic, ginger, tomatoes, chili, masala and turmeric and cook for 2 minutes on medium heat. Add meat and cook for 3 minutes, add water and cook for 5-10 minutes. Season with salt. Add lemon juice, turn off the heat and add coriander leaves to taste.